My studio is my sanctuary. Once inside, I forget about everything else and I become totally immersed in the painting. It’s quiet, peaceful, which lends itself well to self discovery. There is an inner rhythm that leads and I follow, aware not to have any preconceived image or plan. My easel is an old friend, a sentry, yielding to what now takes shape on a stretched canvas hung on the wall. Typically, I prefer working large on six-foot canvases. However, I do work on small oil on paper pieces. Each surface has its own unique characteristics in which the oil paint either cooperates or fights. It is all part of the creation process. Nothing is ever tossed, it eventually finds a purpose within another painting as an adornment or accessory. The desire to work much larger is there, but for now, my little studio in Sedgwick suits me just fine. 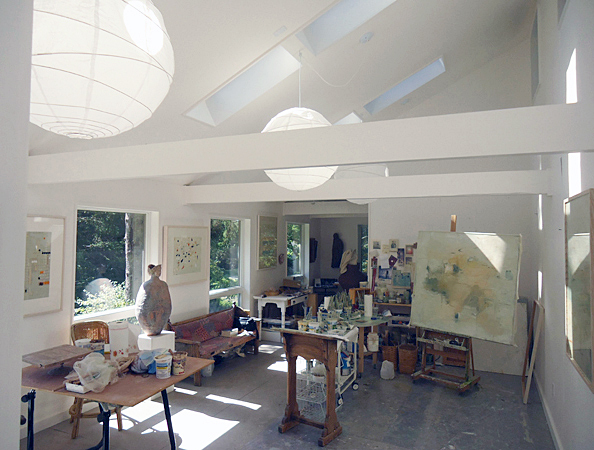 My whole life revolves about the work that happens in my studio. A space of total privacy, separate from my house. Peace and light envelop me when entering. Total silence or listening to music is my choice. It allows me to work in three different mediums: clay sculpture, painting, and drawing. It is the only place in the world where for me time stands still and freedom reigns. It was designed by my son Blas, who is an architect. My studio is on the second floor of a barn attached to our house. 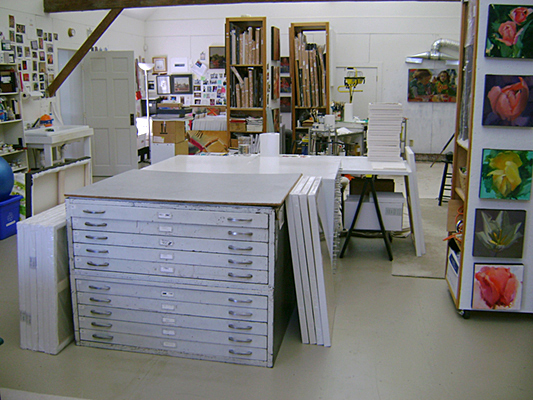 In the center is an island of three flat files. Two doors on sawhorses form my large tables, and six rolling storage closets and all walls have Homasote sides over plywood for nailing. 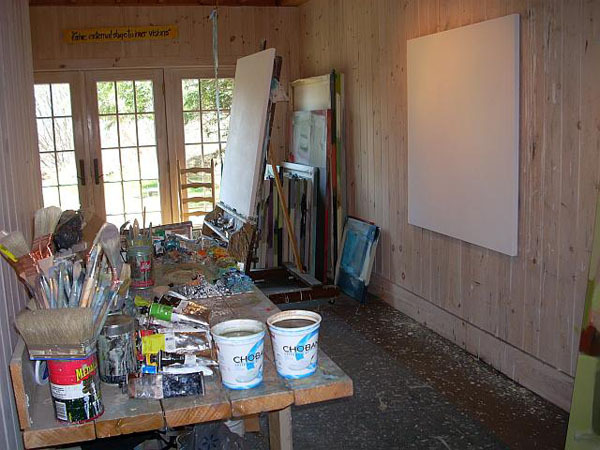 The studio is divided into four general areas: one for painting against the wall or on an easel, a second for my computer and printer, a third for digital photography to document finished work, and a fourth for yoga and reading. There are four windows that connect the space to my surroundings. For painting, I use construction halogen lights bounced off the ceiling to avoid glare and provide consistency day or night. An air exchange unit brings in fresh air and exhausts stale air, and HEPA and charcoal filters capture fumes and particles. Over my sink are images I like looking at. I use another room, on the lower level of the barn, for more storage and image archives.